When I was a little kid in Seattle, my family sponsored another family to come over from Vietnam and live with us. It was the ‘70’s, and my dad heard from my uncle that there were Vietnamese families with kids who had to get out of there NOW. I’m not quite sure how it all went down, but I woke up one morning to Xich, Neim, Bang & Kim living under our roof. I already had seven brothers & sisters, a million uncles, aunts, and an army of extended family & friends, so, at the ripe old age of four, the arrival of another family just seemed like more of the same to me. And, although we didn’t speak the same language, the little girl, Kim, immediately became my best friend, playing Barbie’s and blocks and racing each other up the hill to the Aqua Club for swimming. Now, Xich and Neim, while beyond grateful, did not like to accept charity and insisted on doing SOMETHING for our family while they settled in. So, they cooked. A lot. My mom would sit down with Neim to make a phonetic shopping list in the morning. Then she’d pull on her muumuu, wrap a scarf around her curlers and buzz out to the local market in our wood-paneled station wagon to hunt and gather. Because we lived in Seattle, there were a few Asian items in the grocery store, but, because it was the ‘70’s, those items usually came sealed in tin and labeled “Chung King” (Ever had a CANNED bean sprout? Yeah. Tastes just like Saigon, right?) My mom did her best, Neim adapted her recipes, and we all ate very well. My mom still loves to tell the story about when my niece, Rachel, who was born when I was three years old, first learned to walk. She’d just started trying out that wobbly toddler walk and was practicing in the kitchen. She tumbled again and again . . . until she caught sight of Neim’s fresh batch of Cha Gio. Rachel reached for the platter, clutched a tiny spring roll in each of her chubby little hands and set off for her high-chair . . . and she DID NOT FALL DOWN. The little fried rolls were all she needed to give her the strength and focus to walk. Ah, Rachel, sweetie, I swear, I feel that way sometimes today. I’m not sure how much my mom wrote down about Neim’s cooking. I do remember one tattered recipe for “Fried Bananas” that was measured not in tablespoons or cups, but in numbers of “big spoons”. My mom kept that old, swirly-handled Corning “big spoon” for decades – in fact, now that I think of it, that woman owns over 2,000 jigsaw puzzles. She may still have that damn spoon. When I got pregnant with my daughter, I had the fleeting burrito craving and the occasional mango-obsession, but my go-to for almost ten months was Vietnamese food. The first craving came like a crazy, rogue wave on the beach – I NEED VIETNAMESE FOOD. I didn’t even know WHAT I wanted – -I just knew I needed those flavors and that feeling of home with a capital H. It had been so long since my preschool days in Seattle, I wasn’t even sure of the names of specific dishes anymore. So I would show up at restaurants, clutch the arm of the server, and use my toddler Vietnamese pronunciation to try to get what my belly wanted. Even when the result was not exactly what I remembered, the combination of fish sauce, lime, chili & sugar would jolt my soul back to my childhood . . . and I felt comforted. So I learned to make Banh Xeo. I mixed the rice flour with coconut milk, added tons of turmeric and other spices, and I made that chewy, spicy-sour, unctuous explosion that my baby-body was screaming for. And, as with most of my insane-o-preg-o cravings, I had three bites and I was finished. But I was HAPPY. I knew it was exactly what my body and my soul needed to finish building this beautiful baby. I cook Vietnamese now from time to time, and I always feel a bit of suspense when I put any of it in front of my little girl. When she grows up, will she remember? For me, the taste imprints of those early days are so strong. After all, they are my first memories of life on this planet. I wonder what will happen, many (please, God) years down the road . . . what will my sweet girl be craving? What will her body yearn for as she builds her own child? And I am consumed with the knowledge that I am responsible for so, so much in her life. None of this parenting business can happen by accident. The responsibility is too great to not take care. So I will pay attention. I will lead by example. I will show my daughter what my parents showed me – that we give. We give so that others may have the opportunities we have. We give for no other reason than that, for that moment, we have what someone else needs. And it feels so good to share. 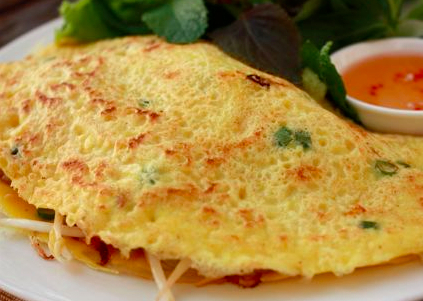 Here’s my recipe for Banh Xeo. It ain’t perfect, but it’s pretty damn good. Mix everything together and let sit for about 30 minutes to mellow. (If you’re not a big raw garlic fan, as I am NOT, blanch the whole clove in boiling salted water for 30 seconds, cool and then slice). Mix the onion, protein (shrimp, tofu or beans), in a bowl. Over high heat, saute ¼ of that mixture in 1 T. of the oil in a hot, nonstick pan for a few seconds. Pour 2/3 c. batter over the sautéing filling and swirl like a crepe to the edges of the pan. Pile on 1 c. bean sprouts and ½ c. sautéed mushrooms on top and then turn your heat to low to finish cooking – cover for about 5 minutes. When the sides are crisp and a little brown (maybe 5-7 minutes), fold side over and slip out of pan. Sprinkle with sauce, garnish and enjoy. **If you’re pregnant, please feel free to take a nap afterward. After all, you’re building kidneys and lungs and such – you deserve a snooze. see if your daughter likes food that you craved when you were carrying her. Awesome story! My wife, who is white and I am Vietnamese, absolutely LOVES Vietnamese food. I just read your blog entry to her and she loved it. She cooks Viet food all the time…I am lucky! Thank you for sharing your story and to your family that was caring enough to sponsor a family back in such a tough time. Maybe we’ll bump into you at a restaurant someday.